Well, I got the part of Beth in "The Mistakes Madeline Made," a play written by Elizabeth Merriwether. She's 25. I'm not. Beth is in "her late 30's or early 40's." I am. This weekend I tried on some clothes and lamented that my body looked like cottage cheese piled into a pair of underpants. How is this fair when I bike and yoga every single day? Note: Mid-life crises. Everyone at the read-through was great. Funny. I think we'll all get along well. Am I the oldest one? Likely. We sat under Sean's new gazebo and read through the whole play without any breaks. There was a lot of laughter. The play has moments of hilarity that are interrupted by deep sadness, like a punch in the gut. Theatre work always makes me key in on conversations and dialogue, and I want to write everything down. Last night I overheard some people I worked with a few years ago talking at a restaurant. God, they were pretentious. They deserved to be eavesdropped on, notated. Who calls women "chicks?" Chicks dig it, he said. Cripes. I have lines to learn. Many of them, but I know I can do it. It's been done before. What makes me sad is this - all these characters, any character that any actor has played, dies the moment the lines vanish from memory. That particular way that character was portrayed, I mean. Sure the character still lives on the page, but it won't have the same life played through another actor. Which is interesting to me. My Beth gets six shows worth of life, and two years from now, I won't be able to recall a word she said. Morning is my best time of the day. These are the few months where I get to spend mornings outside, walking around the yard with my coffee cup, inspecting the insides of bee balm, writing and waiting for hummingbirds to appear above the trumpet vine. Yesterday I was helping a friend with some of her poems, and we discussed our morning rituals - we both consider the early hours well-spent in moodling. Is my domesticity showing in my poems? Yes. Like a loose slip. There ought to be poetry here, or something poetic, but instead there are lentils. My food pantry is empty, but the word pantry is filling. I've been writing. Better to have a fat notebook than a fat, er, rump. Laziness kept me from biking to the grocery store at 6 p.m. 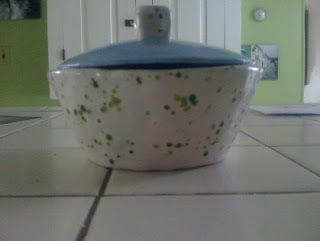 This is what I made last night from what was both inside and outside of the house. Mince herbs. Bring water with broth to boil, add lentils and herbs and cook for 20-25 minutes or until the lentils are just soft – not mealy. At the halfway mark (10 mins?) add the corn. While this mixture is cooking, make the dressing. Set it aside. Seed and cube the cucumber, and mince the onion. When the lentils are done, drain in a colander. Toss and drain, toss and drain. Allow the lentils to cool for at least 15 minutes. Since I’m impatient, I put the colander in the refrigerator for a bit. 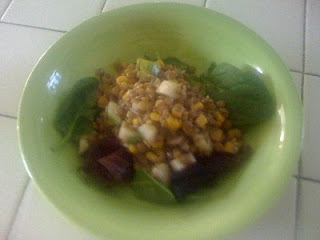 When they are cool, toss in a bowl, add the cukes and onion, and drizzle on the dressing. Mix it all up and serve on a bed of greens. My father used to leave for work every morning briefcase in hand, and on his way out the door he'd say "Be a Do Bee," to me and my sister. For those of you who didn't watch Romper Room, there were two Bee characters - Mr. Do Bee and Mr. Don't Bee, who taught pre-schoolers the differences between right and wrong. The Do Bee Song was a bit of ridiculous fluff that was reminiscent of the Hokey Pokey. Being a Do Bee meant you used your manners, were polite and kind. Being a Don't Bee meant you were a slobbering jerk. Today, when I hear my father's voice telling me to be a Do Bee, I act on it. This morning at church I heard him during a meditation (Happy Father's Day, Dad! ), and when I got to the studio I opened up the packets of materials I received from Heifer International and read through them. Next week I'm starting a "Read-to-Feed" storytime at the studio that encourages kids to read books and gather sponsors to donate for each book they've read. At the end of the program, the funds go to purchase an animal through Heifer to help out a needy family. If this program works out, and the kids are interested, we'll start Get It: Global Education to Improve Tomorrow. I've already learned more about coffee and banana imports than I knew yesterday. Is it the right thing to do? Unsure. The right thing to do would be to pursue some paying venture, probably. This feels like a good thing to do. 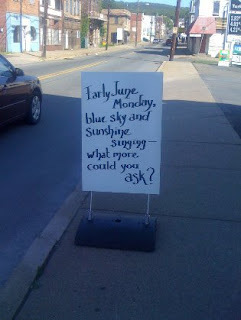 There wasn't much verb in my day yesterday. An hour class in the morning put me into a strange headspace - I napped in the afternoon, read a little Rilke. Later in the day I took Helen to the mall to hang out with her friend, and I did the three hour "vulture mom" loop of the Sprawl-Mall area. Most of my time was spent in the air-conditioned big-box bookstore, where I read the first sentences of various novels. I wasn't motivated enough to write them down, but I think I'm going to make that an exercise to work on today. I have enough books here at home to start it for sure. I'm not positive where I'll go with the idea from there, but it was fascinating to see how authors "grab" their readers. That first sentence is an important one. Francine Prose talks about how she keeps books that have good first sentences in them very near to her writing desk. The rest is personal preference and ritual. Time to brew the coffee. Dan set us up with a photoblog for our iPhones, so it's been a constant chronicle of the daily in pictures for the past couple of days in testing it out. Howard Zinn's "A People's History of the United States" got me interested in reading history again, and I found this book recently. I'm almost finished with it, and will give it to Helen when I'm done. It's a comic book style history of the United States. Brilliant. Eye-opening. 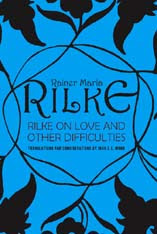 Rilke's "On Love and Other Difficulties" was a gift from a friend. I'm reading and writing comments in the margins. Lots of gems in here, but there's an offhand parenthetical about happiness not being all that important that has left me hanging. I wonder if he clarifies somewhere later in the book? I hope so. NPR's National Story Project is now anthologized in Paul Auster's "I Thought My Father Was God," a collection of essays submitted to and aired on NPR. It's edited and organized well - the flow from one essay into another is never jumpy. Some essays are haunting, others are expected tearful goodbyes at the train. It's a book that emphasizes the important role of storytelling and memoir. One of the last essays is a nod to Paul and his good work with the project, which is good work indeed, but I thought it was a little self-serving. That's just an editorial peeve of mine. Sharp-edged, cynical, reflective, confessional and humorous (some wonderful poems about being a poet and the responsibilities of being one), it's a collection worth reading many times, and then sharing. Summer rearranges my interests. I'm easily distracted, and take on many little projects all at once. Some days, when I get too humidity-slogged, I think I'm not doing anything worthwhile. I need to remind myself that summer offers up a different sort of rhythm than the other seasons of the year, and I should relax and recognize what it is I have managed to accomplish. So here's a little photoblog of what I've been up to this past week. 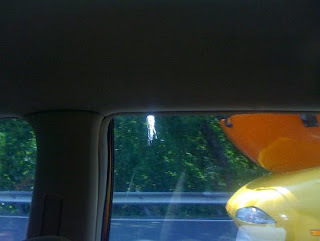 Quite possibly the worst photo (or most pornographic) of the Oscar Meyer WeinerMobile, ever. On our way to New York City last week, we got caught in a food conversation - we were all hungry. Jim and I were discussing the glory of Entenmann's cheese danish, and an Entenmann's truck appeared. Then hot dogs were mentioned, and The WeinerMobile passed us. We all laughed, took out our cameras, and snapped away. This is what I got. Interesting. I spent some time with my mom last week while she went through some surgery. This is her cat, Miss Havisham. This was a rare moment. 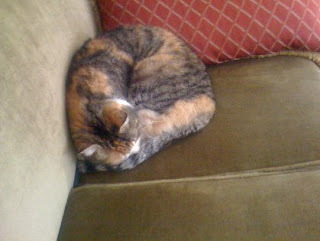 I usually only see her back end as she scuttles away into the basement. 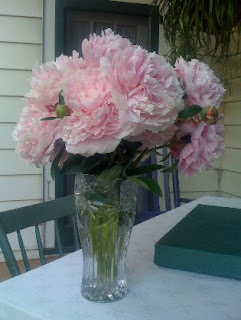 A gift of newly-opened peonies from Mom's good friends. 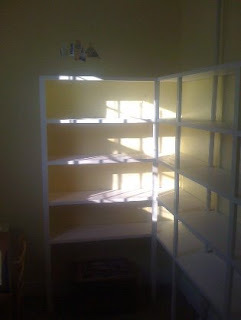 We had shelves in the studio office/library rebuilt. On Monday, I repainted the entire room. It's cheery, and all the books are now re-shelved, the window has a sheer curtain (only $5!) and my desk is set up. Thanks to Dan, we now have wireless internet there too. 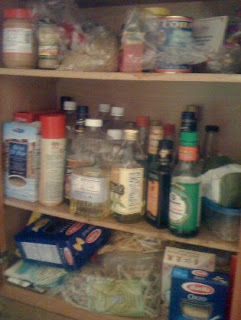 The pantry after cleaning. 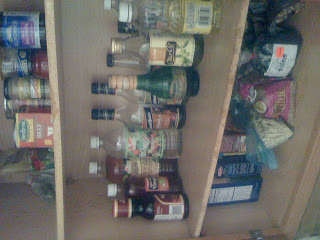 I have a lot of vinegar, so I cleaned out the coffeepot, too. I can't stake a claim to this. Helen made this at school. Handbuilt. I like the glaze choices a lot. Today I'll finish handlettering a children's story I wrote as a friend's baby shower gift. One of a kind! My hand got really tired yesterday doing the writing. I'm about halfway through the text. I also have wedding invites to make, a billboard to design, a book to layout, and various other projects in the queue. They'll get done. I just need to relax into them. Summer. I have two poems in the new issue of The Chimaera, and an interview with Kristy Bowen (written by Talia) about keeping a studio space in Oranges and Sardines. What great company! Alison Brackenbury's poem, "The Book of Weeds" in The Chimaera is really lovely.